Box vs Citrix ShareFile. What is the best of File Cloud Storages? 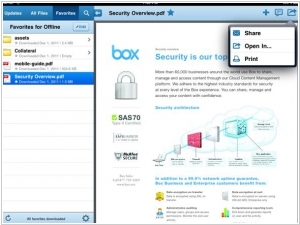 Box offers free cloud storage and file sharing services that enables you to securely share and access files online. Companies rely on Box because it's secure, works on any device and scales to meet the needs of small businesses and Fortune 500 companies. Box free alternatives are: Google Drive, OneDrive. ShareFile allows businesses to securely send large files to anyone, anywhere. Send big files up to 100 GB from your PC, Mac, or mobile device. Citrix ShareFile allows you to create a custom-branded, password-protected space where you can exchange business files with clients easily and securely. Whether you need to send large files by email, conduct a secure file transfer or set up a collaboration space for project-related files, ShareFile has the solution for you. Box CEO Aaron Levie announced that Cloud Wars are over. At least in terms of cloud storage costs. From now, the normal price of this resource is zero. In other words, Box cloud storage for business now has no limit on the size and number of files that your employees can upload to your online account. Recall recently Google launched the enterprise version of Google Drive also with unlimited cloud storage. Besides the unlimited storage, Box introduced integration plugins for Office 365. First plugin - for Outlook - allows you to quickly attach file links to emails from Box (instead of sending files). Second - for desktop Office editors - allows to open documents from Box online storage and save them backward.